Not all engagement rings are created equal, which is a great thing because that allows every woman to pick a ring that truly fits her style and unique personality. 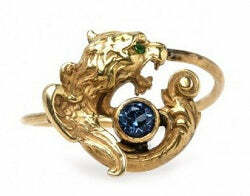 Animal engagement rings are quirky, fun, and perfect for the animal lover who also appreciates interesting jewelry. 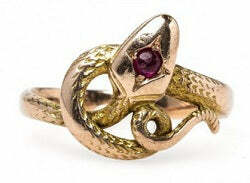 Snakes, lions, griffins, and more: Trumpet & Horn has a variety of options to please jewelry and animal lovers alike. Bayswater Nature-inspired jewelry was very popular in the late 1800s, which explains why animal style rings and pieces from the Victorian era are fairly common. A prime example of one of these rings is Bayswater, a very unique ring resembling a griffin wrapped around a sapphire stone. The detailing in the gold of this ring is intricate, with handmade scales and wings. The shape and design of animal engagement rings are typically the main focal points, which is why the sapphire featured in Bayswater is large enough to draw the eye but not overshadow the griffin. Another added touch of detail to this ring is the hint of emerald that comprises the eye. 14k Gold Lion Crest This design allows you to incorporate an animal in your ring while still allowing you to have a more traditional ring. The 14k Gold Lion Crest ring from Trumpet & Horn is vintage inspired and provides engraved detailing rather than a gemstone. This ring is very unique, but also simple enough to please those who shy away from more intricate pieces. 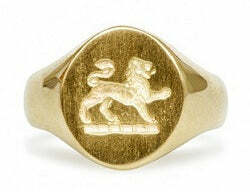 If gold isn’t really your style, the Lion Crest ring is also available in a silver option. Figaro Love cats but want something more detailed than a crest? The good news is animal engagement rings come in a variety of options, which means this is not a problem at all! In fact, Figaro is perfect for any cat lover. 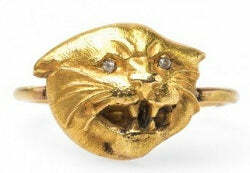 This 14k yellow gold ring is in the shape of a cat’s head and features extraordinary details to make it as true to the real thing as possible. These details include whiskers, teeth, and a feline nose, as well as two diamond eyes that really put this ring over the top. Figaro comes from the late Victorian era, is approximately 120 years old, and in remarkable condition. Redbridge Believe it or not, the serpent is actually considered a symbol of love, which is why Redbridge would be an excellent choice for the animal loving woman in your life. As far as animal engagement rings go, Redbridge is topnotch. The 14k yellow and rose gold band bends around in the coil shape traditionally associated with a snake and is marked throughout with a meticulous scale detailing to really resemble a serpent. A gorgeous ruby is embedded in the center as an additional element that makes this ring so stunning. At Trumpet & Horn, we understand that an engagement ring is both a symbol of the relationship as well as a reflection of the woman wearing the ring. Our goal is to find the best vintage and vintage inspired pieces of jewelry and make them available to you so that you can find the perfect piece to accomplish the aforementioned tasks. Animal engagement rings might not be for everyone, but they are perfect for some women and we are proud to offer a selection of animal inspired jewelry.